2-10 years of experience who are ready to take their careers to the next level. an internationally renowned, 360o education in finance and management. the next generation of CEOs and CFOs transforming global markets. The business leaders of tomorrow must possess in-depth expertise of financial markets, while simultaneously understanding how to communicate and manage teams, client relationships and companies’ interactions with the world. This Dual Degree program provides the complementary skills, knowledge and experience that you need in order to join the next generation of corporate leadership. Fast-track your professional journey to the top tiers of leading financial institutions, investment banks, hedge funds and private equity firms around the world, and become the kind of professional who stands out from the crowd. This Dual Degree unites IE Business School’s internationally renowned IMBA with its highly specialized Master in Advanced Finance, providing expert insight into the financial world along with a world-class education in international business. Designed by leading finance and management professionals, the program empowers students to reach for the upper echelons of the corporate arena. It imparts the knowledge needed to make high-stakes financial decisions from a big-picture business perspective, and drive innovation and progress. If you choose to pursue this program, you’ll be challenged to put into practice everything you know about business—and then some. In less than two years, you’ll acquire an unparalleled understanding of general management, as well as one of the best financial educations in the world. Upon completing the IMBA and Master in Advanced Finance Dual Degree, you’ll emerge from IE as a versatile financial professional with the management skills required to lead the world’s best companies, institutions and organizations into the future. The IMBA is an official degree program. Students must fulfill the requirements listed here to be issued an Official University Degree upon its completion. The Master in Advanced Finance is a University Private Degree from IE University,* taught at IE Business School. University Private Degrees are earned by completing cutting-edge programs that focus on the practical applications of theoretical studies. 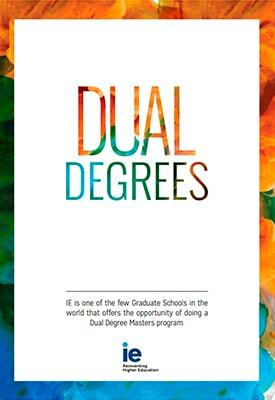 Although they do not qualify students for doctorate programs, these degrees impart the pragmatism and expertise needed to build a successful career in finance, and reflect the entirety of IE University’s rigor and prestige. IE Business School is accredited by the following international bodies: AACSB, AMBA and EQUIS. I graduated from the Master in Advanced Finance in 2009. After that I worked in a leading Spanish M&A boutique, and now I am working in M&A in New York. Prior to IE, I was working in strategy and finance at IBM, but I believed the banking sector would be a better fit for my profile… I have been able to leverage the education and networking opportunities that IE offers.